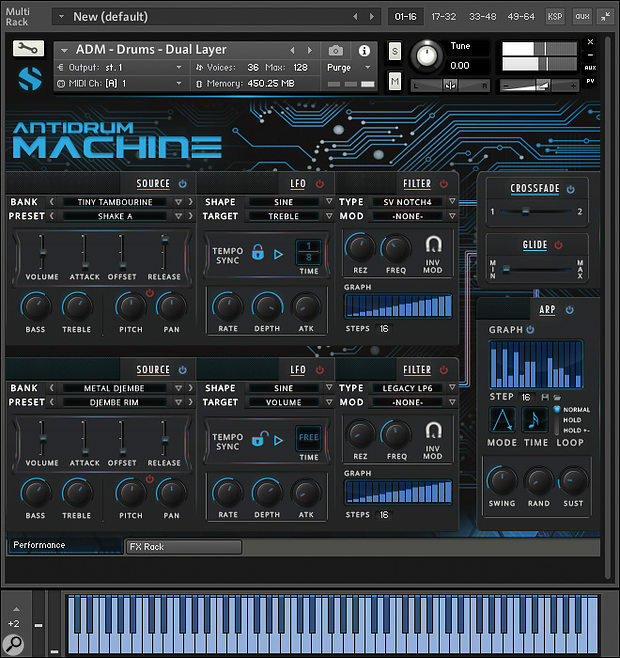 Soundiron have released three previous volumes of their Antidrum Machine libraries for Kontakt. However, the latest release combines volumes 1, 2 and 3 while also adding a fourth with completely new content. As the ‘anti’ suggests, what you are getting here are predominantly rhythmic sounds, but not based upon conventional drum or percussion instruments. Instead, more experimental sound sources dominate, with found sounds, field-based recordings, various surfaces being struck, machine noises and a selection of clicks, clacks, ticks, tocks and other ‘alternative’ percussive noises. That said, there are some drum-like sounds included as well as some drones, and, because of the rather impressive Kontakt front-end, it is also possible to get tuned sounds from the instrument, and there plenty of presets included that demonstrate just that. The library will run with either the free or full version of Kontakt, contains over 21,000 samples and totals over 8GB of (lossless) compressed 24-bit samples. The presets are organised into four folders; Ambiences, Dual-Layer, Ensembles and Single Effects. The Ambience folder contains a small number of dual-layer drone-style presets, while the Single Effects group contains a selection of single-sound presets but featuring keyswitching between different raw sounds. However, the bulk of the action is to be found within the Ensembles (various presets with different sounds mapped across the keyboard) and Dual-Layer (blending two percussive sounds) sections. There are plenty of options here and, while the presets provide a great starting point, you can swap in/out raw sounds via the front-end to explore different options. The basic sounds themselves are very good indeed, but equally impressive are the options that the interface provides to manipulate these sounds and perform with them. The available controls do vary somewhat depending upon which folder a preset might have come from, and if your eyesight normally has you squinting at your computer screen, then you might want to reach for your reading glasses before digging in, but once you do start digging, there is a lot to explore. This includes some excellent filter options with LFO and step-based control, volume envelope controls, EQ and a range of colourful, but very creative, effects. However, for me, the real highlight is the step-based arpeggiator that offers velocity-sensitive patterns up to 32 steps. This makes it incredibly easy to get some great percussive grooves going, and used with one of the Ensemble patches (for example), lets you create complete rhythmic beds where you can vary the sounds by simply changing the collection of notes you hold down at any one time. Antidrum Machine will undoubtedly appeal to composers working to picture who are looking for some quirky but characterful percussive sounds. And, at what is a pretty modest asking price, you don’t already have to have scored a hit movie or written a dancefloor hit to afford it. If your eyesight is up to it, Antidrum Machine is a very creative percussive instrument.